This hat is made in two sections: the hat body and the crown. Both are worked separately, in the round, from the top down. The body of the hat is worked first. Once it is complete the crown is worked on a separate needle. 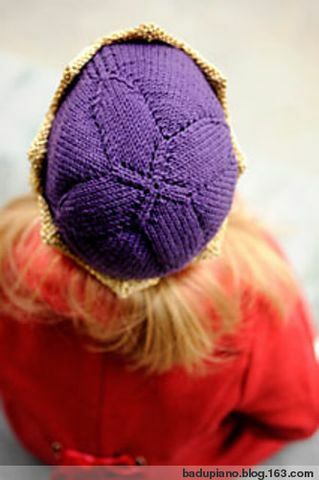 The two pieces are joined together by layering the crown on top of the hat and knitting them together as one. The hatband is worked last and is finished with a facing and hem. The crown, hatband, and facing are used to make the alternate version of this pattern. The eyelet bands in the body of this hat make it very stretchy, so it will accommodate a wide range of sizes. The measurements below reflect each hat size with and without stretching. With MC and US 4 dpns, CO 8 sts. Divide the stitches evenly on four needles. Join in the round, taking care not to twist stitches. Note: Continue to work on dpns until the stitches become crowded, switching to 16" US 4 circ needle when necessary. You will begin with 2 sts on each dpn, using a 5th dpn as the working needle. Keep the stitches arranged on the four dpns until you work through Rnd 7 and place the marker on Rnd 9. Rnd 1: *K1, yo, k1; rep from * to end—12 sts. Rnd 2 and all even rounds through Rnd 18: Knit. Rnd 3: *K1, yo, k1, yo, k1; rep from * to end—20 sts. Rnd 5: *K1, yo, k3, yo, k1; rep from * to end—28 sts. Rnd 7: *K1, yo, k5, yo, k1; rep from * to end—36 sts. Rnd 9: *Yo, pm, k9, pm; rep from * to end, placing a contrasting marker at the end of round—40 sts. Rnd 11: *Yo, k1, yo, sm, k9, sm; rep from * to end—48 sts. Rnd 13: *Yo, k to marker, yo, sm, k9, sm; rep from * to end—56 sts. Rnds 15 and 17: Rep Rnd 13—72 sts. Note: For 6–12 months size skip to Rnd 1 of Hat Body after completing Rnd 18. Rnds 19 and 21: Rep Rnd 13—88 sts. Rnds 20 and 22: Knit. Note: For 2–4 years size skip to Rnd 1 of Hat Body after completing Rnd 22. Rnds 23 and 25: Rep Rnd 13—104 sts. Rnds 24 and 26: Knit. The stitch count from the previous section is maintained throughout the following eight rounds—72 (88, 104) sts. Rnd 1: *Yo, k9 (13, 17), yo, sm, ssk, k5, k2tog, sm; rep from * to end. Rnd 2 and all even rnds: Knit. Rnd 3: *Yo, k11 (15, 19), yo, sm, ssk, k3, k2tog, sm; rep from * to end. Rnd 5: *Yo, k13 (17, 21), yo, sm, ssk, k1, k2tog, sm; rep from * to end. Rnd 7: *Yo, k15 (19, 23), yo, sm, sk2po, sm; rep from * to end. Rnd 9: *Yo, k17 (21, 25), yo, sm, k1, sm; rep from * to end—80 (96, 112) sts. Rem odd rnds: *Yo, ssk, k15 (19, 23), k2tog, yo, sm, k1, sm; rep from * to end—80 (96, 112) sts. Continue in patt until piece measures 61?2 (7, 8)" [17 (18,20)cm] from top of hat, ending with an even round. Do not cut yarn; you will use it to join the hat and the crown together. Put the hat aside and work the crown. With 16" US 5 needle and CC, CO 96 (112, 128) sts. Join work in the round. Rnd 1: Knit, placing a marker and pm every 12 (14, 16) sts and placing a contrasting marker at the end of the round. Rnd 2: *Yo, p4 (5, 6), sp2po, p4 (5, 6), yo, p1, sm; rep from * to end. Rnds 4–11 (4–15, 4–19): Rep last two rounds 4 (6, 8) times. Rnd 12 (16, 20): This is a dec rnd, *p4 (5, 6), sp2po, p4 (5, 6), p1, sm; rep from * to end—80 (96, 112) sts. Rnd 13 (17, 21): Knit. Rnd 14 (18, 22): Purl. Rem rnds: Rep last two rounds 1 (2, 2) time(s). Do not cut yarn. Place crown over the hat so that the RS of both pieces are facing you, the first stitch of the Hat Body and Crown are lined up together, and the needles are parallel to one another. With 16" US 4 needle and the MC, knit the two pieces together by inserting the RH needle into the first stitch of both the crown and the hat at the same time. Knit these 2 sts tog as if they were a single stitch. Rep for all stitches on the two needles. Rnd 1: Continuing with MC and US 4 needle, purl. Rnd 2: With CC, *k1, sl 1 wyib; rep from * to end. Rnd 3: With CC, *p1, sl 1 wyib; rep from * to end. Cut CC, leaving a long tail for weaving in later. The remainder of the hat will be worked with MC. Rnds 4, 6, and 7: Knit. Rnd 8: *K2tog, yo; rep from * to end. This round forms the picot edge of the hatband. Rnds 9–14: Knit. These rounds form the facing of the hat edging. Weave in ends. Turn the facing to the inside of the hat along the picot edge and sew in place. Because of the lacey shaping at the top of the hat, you will need to block the hat over a hat form. If you don’t have a hat form you can make your own by stuffing a plastic bag with paper and/or plastic bags. Stuff and shape the form to the size needed and seal it with tape. Wash or mist the hat with warm water. Put the hat over the form, leaving it there until it is completely dry. Sometimes you need a crown to be just a crown. 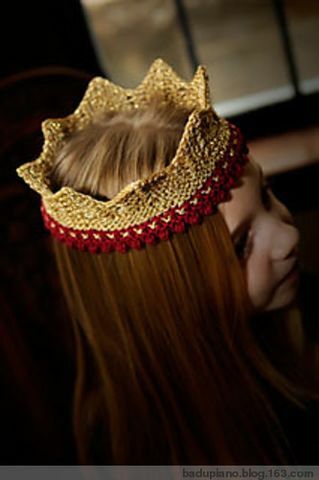 To make the crown without the hat, work the Crown followed by the Hat Band section of the pattern. The hat band and facing give the crown body and make it soft and comfy against the skin.